Are you looking for an alluring getaway with great cuisine? Why not try staying at one of Palm Springs' charming boutique hotels that also serve exceptional cuisine. 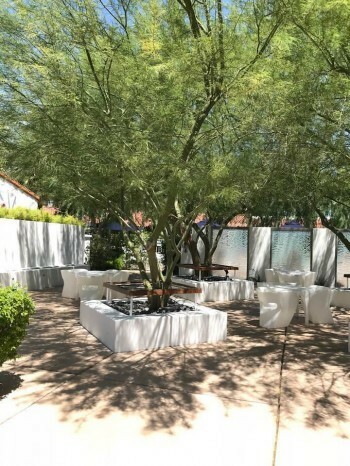 My food writing colleague, Linda Milks, and I just returned from a whirlwind gourmet dining experience in Palm Springs where we discovered some outstanding resaurants in small hotels that we would like to recommend. We enjoyed some wonderful restaurants with lots of ambiance and also some scrumptious dishes. 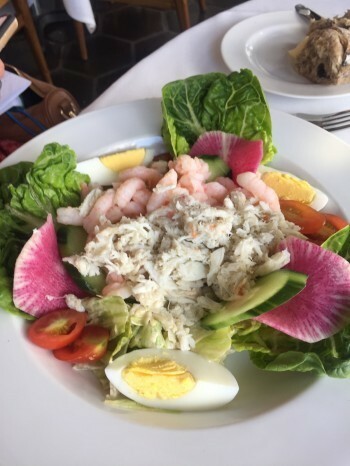 Our first lunch stop was Melvyn’s located at the charming Ingleside Inn. This elegant restaurant was a favorite spot for the glamorous “rat pack” in the 1950s and 60s. During previous visits to Melvyn's, we have enjoyed classic dinner dishes served by tuxedoed waiters in a stylish old world setting. Melvyn’s is particularly known for its tableside cooking specialties, such as Steak Diane and Wilted Spinach Salad, plus delectable flaming desserts, such as Cherries Jubilee and Bananas Foster. You can just imagine Frank Sinatra, Dean Martin and Marilyn Monroe relishing this culinary show and then adjourning to the restaurant’s Casablanca Lounge for nightly entertainment and cocktails. (Sometimes, of course, these celebrities were the entertainment.) For anyone new to Palm Springs, Melvyn’s is a must if you want to step back in time and enjoy the authentic ambiance of old Palm Springs—just like Hollywood’s famous celebrities did. Melvyn’s talented Executive Chef is Jennifer Towne, a graduate of the New England Culinary Institute, who has extensive restaurant experience. Her focus at Melvyn’s is on using fresh, seasonal ingredients while still serving some of the classic specialties of an earlier era. Other popular dishes include Cobb Salad, Chicken Pot Pie, Steak Diane and Chicken Paillard. 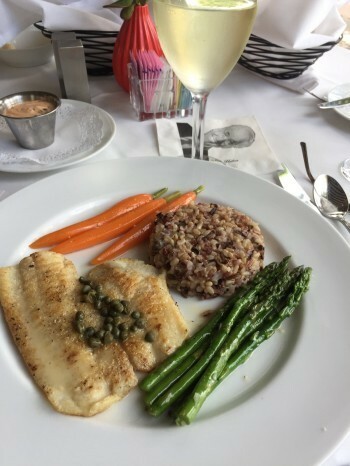 Melvyn’s is open for lunch during the week from 11:30 a.m. to 2 p.m.; for dinner Sunday through Thursday from 6 to 9 p.m. and to 10 p.m. on Friday and Saturday. Brunch is served from 11:30 a.m. until 2 p.m. on Sundays. After lunch, we toured the Ingleside Inn and looked at several inviting rooms. We loved the Inn’s enchanting, relaxing setting—and what a bonus to have Melvyn’s right on the property. (The pool photo at the beginning of this article is from Ingleside.) I am definitely coming back for a romantic getaway. 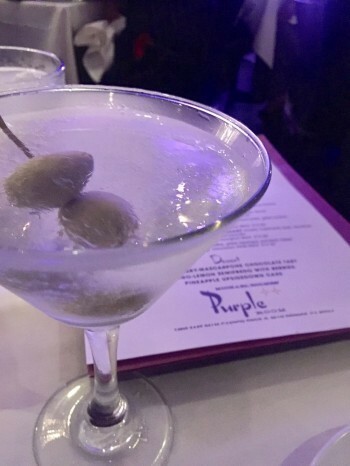 Continuing with our rat pack theme, we were thrilled to experience dinner and a show at the celebrated Purple Room, located in the Club Trinidad Hotel. This is a classic supper club that still evokes the bygone era when Hollywood stars escaped to Palm Springs to party, perform and relax. We could easily imagine Frank, Dean, and Sammy crooning in this intimate setting. They may not be around now, but stellar entertainment is still featured six nights a week in the Purple Room. 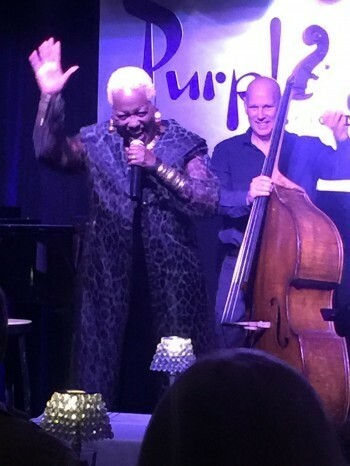 On the night we visited, we were fortunate that blues/jazz singer Rose Mallet was performing with a three-piece backup band. We stayed for all three of her sets since we so much enjoyed her old favorites, engaging style, and witty banter. The dining tables in the dimly lit room with a purple glow were close together and everyone was having fun. We enjoyed icy martinis and a shrimp cocktail before dinner. Linda ordered steak and I had a scrumptious pasta dish made with vegetables, shrimp and dried tomatoes. Other enticing dishes on the menu included the Purple Pear Salad made of pears poached in port, and served with goat cheese and candied pecans; Honey Glazed Salmon with purple mashed potatoes; and Creekside New York steak served with blue cheese, grilled onions, fondant potatoes and grilled zucchini, accompanied by a peppercorn whiskey sauce. (Linda ordered this steak dish and loved it.) We also tried a uniquely delicious pineapple upside down cake. The Purple Room opens at 4 p.m. Tuesday through Sunday, September through late July. There is no charge for entertainment (6:30 to 9:30) on Tuesdays, Wednesdays and Thursdays. Special ticketed shows are presented on Fridays and Saturdays. Every Sunday night, Purple Room owner Michael Holmes presents The Judy Show, an hysterical parody of the famous 1963 television show. Details for purchasing tickets and making reservations are on the Purple Room’s website. The next day, we had a lovely lunch at Azúcar (which means “sugar” in Spanish), located in the luxurious La Serena Villas. This lushly landscaped, stylish property has 18 guest villas set around a shimmering pool with the restaurant opening to the pool. Each villa has a private patio, claw foot tub, fire-pit, and artistically furnished rooms. An added bonus is the gourmet restaurant with its rooftop lounge and dramatic views of the majestic San Jacinto Mountains. Personable Azúcar Executive Chef Joane Garcia Colson greeted us and described her background and approach to her dishes. Surprisingly, we learned that Chef Joane gave up her successful career as a trial lawyer to embrace cooking, her true passion. 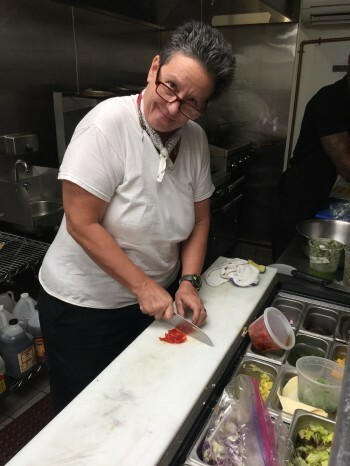 She graduated with honors from the prestigious Arizona Culinary Institute and established Dish, a successful restaurant serving creative cuisine in Palm Springs. She joined Azúcar in January 2018 as its executive chef and has loved every minute of creating imaginative, fresh, healthy dishes. She shared a variety of her dishes with us and we were impressed. We loved the tasty Ahi Bruschetta served with chopped tomatoes, edamame puree, mico-greens and a tangy soy dressing. Unique Cauliflower Risotto, made with pesto, leeks, mascarpone, and parmesan was creamy and full of flavor. 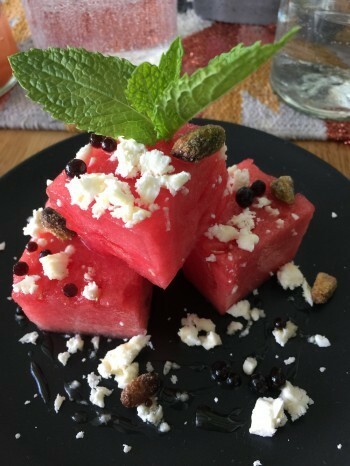 The refreshing Watermelon Salad was beautifully presented with feta cheese crumbles, golden balsamic pearls, and candied pistachios, all drizzled with a light honey lime mint sauce. I especially savored the crunchy Brussels Sprouts Salad created with shaved Brussels sprouts, hard goat cheese, promegranate seeds, and a lemon mustard vinaigrette. 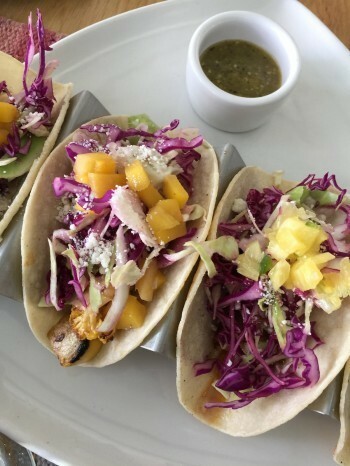 The Fish (Escarole) and Cauliflower Tacos were also wonderful, served in soft taco shells with yellow squash cabbage, chipotle crema, mango habanero salsa, and cotija cheese. We enjoyed these vibrant dishes with innovative craft cocktails. I especially loved my blood orange margarita. A feature of the dinner menu is Escolar dusted with mesquite, and served with hominy and an avocado puree, smoked pineapple and jalapeno salsa. On the dinner menu you’ll also find New Zealand Lamb Chops, Grass Fed Ribeye, Jidori Chicken Breast, and Risotto Stuffed Zucchini. At lunch you can enjoy Fish & Chips, Beef Sliders, Lettuce Wraps or Cauliflower Tacos. The menu changes seasonally so even if these items aren't all on the menu when you visit, you will find other appealing items. Azúcar is open daily from 8:30 a.m. to 2:30 p.m. and 5 p.m. to 10 p.m.
We checked into Alcazar, an enchanting boutique hotel, managed by Foundation 10 Creative, an enterprising group that also owns Birba and Cheeky’s, popular restaurants on the same property. F10 is owned by Tara Lazar, an experienced, innovative chef and hotelier. We adored the serene, lush setting at Alcazar with its welcoming alcoves for relaxing outside surrounded by soothing walls of streaming water. After checking in, we enjoyed sipping wine on a lovely shaded patio. The rooms were luxurious in their chic simplicity and the beds oh so comfortable. My room had a huge Jacuzzi tub that invited utter relaxation. Friendly Robert Hunt, the property’s manager, greeted us warmly and made us feel right at home. In the evening he escorted us to Birba (which means "scoundrel" in Italian), a modern, outdoor restaurant that encourages lingering over cocktails and good conversation. At Birba, we met outgoing Executive Chef, Erik Dandee, who described his approach to the restaurant’s cuisine as fresh and creative with an Italian focus. He emphasized that his dishes consist of locally sourced ingredients whenever possible. Erik Dandee was trained at culinary school in Scottsdale and moved to Palm Springs last year after working in several upscale Portland, Oregon, restaurants. We ordered two of Birba’s imaginative cocktails to launch our dining experience. 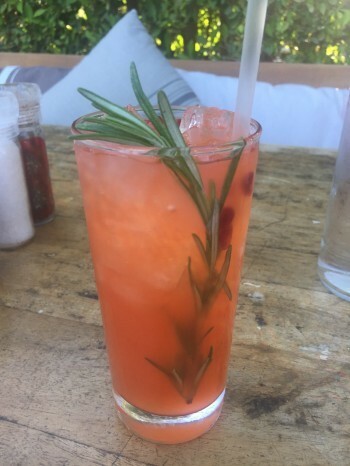 I enjoyed a beautiful and refreshing Italian Greyhound, made of vodka, aperol, grapefruit, smoked salt, and fresh rosemary. Linda happily sipped her Perfect Mission, made of fig-infused bourbon, aperol, dry vermouth, and orange bitters. 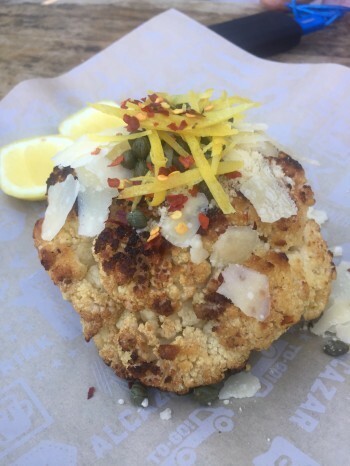 The chef recommended two favorite starters—delicious Roasted Cauliflower adorned with capers, aged parmesan, and chili flakes, and Nonna’s Meatballs, made of pork and beef, and swimming in a zesty housemade marinara sauce. Birba specializes in homemade pastas and pizzas so we shared the tasty Birba Pizza, which features flavorful prosciutto, drizzled with honey and chili oil. We ordered our pizza with a cauliflower crust. Gluten free crusts are also an option and there are a wide variety of pizzas to entice you. After dinner we adjourned to another of F10’s properties, Seymours, a classic bar that reminds me of the speakeasys of days gone by. The small, cozy bar hidden away in Dr. Lyon’s restaurant offers enticing craft cocktails in a dimly lit, atmospheric setting. It was gin night at Seymour’s and we tried two of their gin specialties. I loved the Au Pair made with gin, pear liqueur, grapefruit juice, and bitters. This was a relaxing and perfect way to conclude a glorious day in Palm Springs. The next morning, before embarking on a celebrity architectural tour, we had an early breakfast at Cheeky’s, also on the Alcazar property, and met its amiable chef, Jose Ramirez. Cheeky’s is a popular breakfast and lunch spot that serves an especially creative breakfast menu known for its unique egg benedicts. We really loved the salmon hash benedict. It is so nice to have Cheeky’s and Birba right on the lovely Alcazar property. I certainly recommend doing what we did: Stay all night at Alcazar, have dinner at Birba and breakfast at Cheekys. Birba opens at 5 p.m. everyday but Monday, and is open until 11 p.m. weekdays and 12 a.m. on Fridays and Saturdays. Cheeky’s is open everyday but Tuesdays from 8 a.m. until 2 p.m. There are a variety of other small hotels in Palm Springs that include restaurants offering wonderful meals, including Draughtsman at Arrive Palm Springs, Reservoir at Arrive Palm Springs, and SOPA at L’Horizon Resort and Spa, known for its upscale take on American, Italian and Mediterranean cuisines. 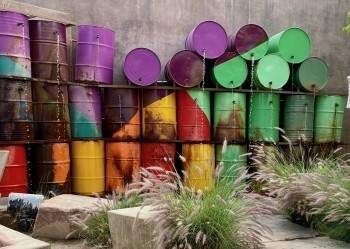 Did you know there are 77 boutique hotels in Palm Springs? A future article will look in more detail at some of these charming accommodations with so much character, but it is nice to know that at several of them you can dine so elegantly as well as sleep so comfortably. 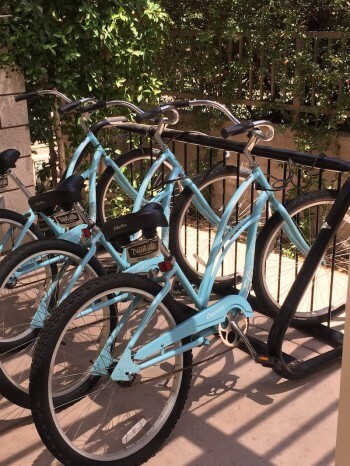 If you live in Southern California, Palm Springs is such an easily accessible getaway — and if you live further away, Palm Springs is definitely a wonderful destination for a special trip. 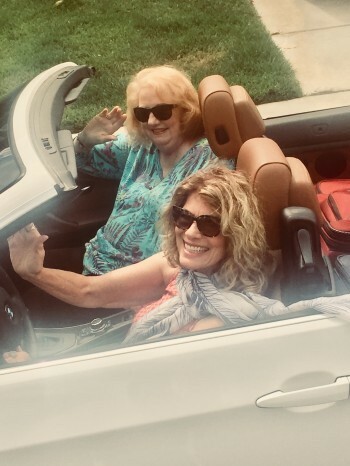 Linda and Sue set off for their Palm Springs culinary adventure.